One of the best happy hours around. Go for the BOGO drinks, stay for the beer pong and karaoke. Absolutely nothing to complain about. The staff was friendly, the service was quick, the food and drinks were both superb. 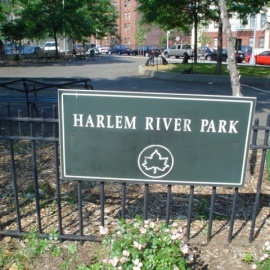 Harlem New York was settled in the 1600s. Harlem is full of history, unique architecture, and mixed cultures. Harlem occupies northern Manhattan Island. The boundaries of Harlem are between 155th street and East 96th. Harlem is to the east of Central Park. Many Harlem residents enjoy listening to music and watching shows at The Apollo Theatre and the Theatre of Harlem. Harlem has developed a great reputation for having amazing food, flashy clubs, and good music, particularly jazz. The jazz music attracts people from all over New York. Harlem became a mostly black community soon after World War I due to many African Americans moving up from the southern states. Harlem New York is still known today as a mostly black community. New Yorkers came flocking to Harlem in the early 1900s due to electric railways and booming properties. Most of the clubs in Harlem attract the midtown caucasian crowd of young men and women as well as some of the Harlem locals. The clubs come alive at night with the smell of good food in the air and jazz at your ears. New York City is one of the most visited cities in the world and why? Bustling entertainment, delicious food concepts, the best skyline in the world, and some of the most diverse museums. Join NYC Parks Art, Culture & Fun for live jazz concerts with world class musicians from the Jazz Foundation of America. All children in the St. Nicholas community are invited to our Easter Egg Hunt after Paschal Agape Vespers. Touted as one of the most empowering and inspirational networking events in New York City, the Bougie Brunch returns with a festive Uptown flair! Join the BB Group for a celebratory gathering for women of color to connect. Come Experience The Sights and Sounds of the Kentucky Derby - Harlem Derby Style! Cinco de Mayo is NOT Mexican independence day. It’s actually a celebration of the Mexican Army’s unlikely win over the French at the Battle of Puebla. Bring Your Mother & Grandmother To The Grove On Mother's Day. Pastor Crawford Will Be Delivering A Special Word Just For Them.